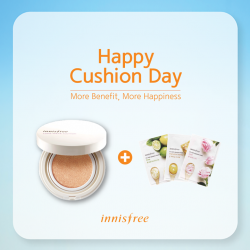 [inni event] Dear innisfree members, 20 August is My Cushion Day! *While stocks last. Only available on 20 August for innisfree members. Limited to 10 Cushions per member. Not applicable to membership points accumulation or redemption. Membership card be must presented upon purchase. Terms and conditions apply. [inni event] Dear innisfree members, our Cushion Day is coming soon on 11 June! *While stocks last. 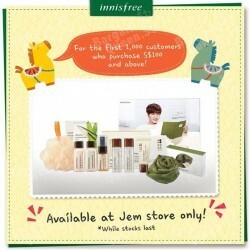 Only available on 11 June for innisfree members. Limited to 10 Cushions per member. Not applicable to refills. Membership card be must presented upon purchase. Terms and conditions apply. Innisfree's Cushion Day is on 9 April! 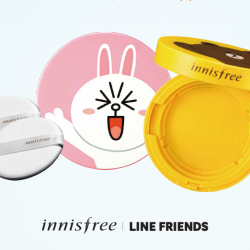 Exclusively for innisfree members,receive an Eco-Friendship Cushion Case with Brown or Cony and 2 Air Magic Puffs with purchase of any Innisfree Cushion! While stocks last. Their exciting gifts are awaiting you! For purchase above S$50, receive a limited edition innisfree x Paul Frank Pouch. Pamper your skin with their Sleeping Pack Collection Kit, plus receive an innisfree x Paul Frank Pouch with purchase of S$100 and above! While stocks last. 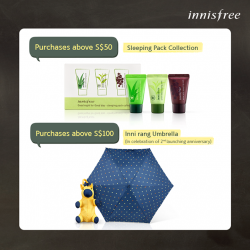 In celebration of their 2nd Anniversary in Singapore, they are giving away the adorable Inni rang umbrella with purchase above $100 in store! For purchase above S$50, receive a Sleeping Pack Collection! While stocks last. Add a splash of colour to your lips with the Vivid Tint Rouge! Receive a Green Barley Cleansing Tissue with purchase of Vivid Tint Rouge now. Grab now while stocks last. Inni event! They’ve finally opened their 4th store in Singapore and they look forward to meeting you there! For the month of April, they’re giving away a special GWP bundle for the first 1,000 customers who purchase S$100 or more at their newest store! Do visit them today at Jem #02-36! Inni event! For the month of March, receive an Apple Juicy Cleansing Trial Kit with every S$50 purchase and a Green Tea Balancing Trial Kit with every S$100 purchase in store! 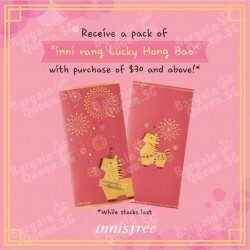 From 19 Jan onwards, receive a pack of inni rang Lucky Hong Bao with any purchase of $30 and above! While stocks last. 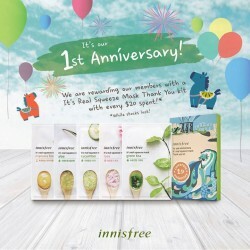 Innisfree Singapore is a year old this November and they want to thank you for supporting them! With every S$20 purchase, innisfree members will receive an It’s Real Squeeze Mask Thank You kit! 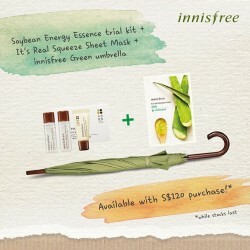 Receive an innisfree Green umbrella on top of the Soybean Energy Essence trial kit and It’s Real Squeeze Sheet Mask with every S$120 purchase at Innisfree! 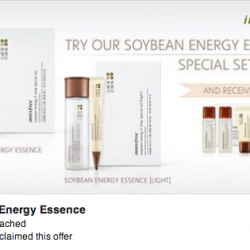 Redeem a Soybean Energy Essence trial kit with 1 Special Set @$59 from innisfree! 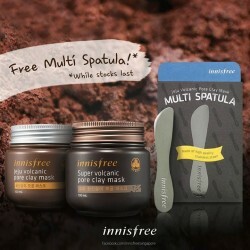 For the month of August, receive a Multi Spatula with every purchase of our Super or Jeju Volcanic Pore Clay Mask from innisfree! 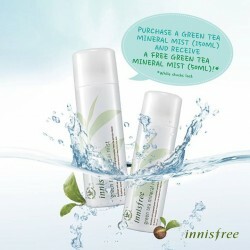 Receive a free Innisfree Green Tea Mineral Mist (50ml) with the purchase of Green Tea Mineral Mist (150ml) from now till 31 August 2014! For the month of August, receive an Apple Juicy Cleansing trial kit with every S$49 purchase and a Tangerine Blossom Perfumed Body travel kit with every S$100 purchase at innisfree! 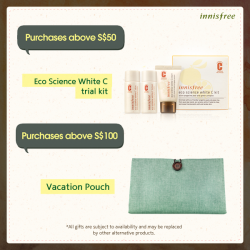 Receive an Eco Science White C trial kit with every S$50 purchase at innisfree now! Top up to $100 purchase receive a vacation pouch! Innisfree | Super Volcanic Pore Clay Mask promotion At Takashimaya S.C.
Innisfree is treating you with a complimentary skincare consultation! 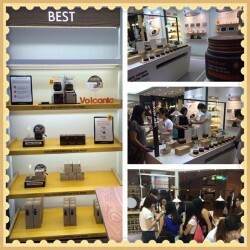 Visit Innisfree's Super Volcanic Story Zone at Takashimaya S.C. #B2-34/35 from now till 31 Jul. 2014(1-8PM daily) and receive up to 3 sachets of Super Volcanic Clay Mask! What's more? Purchase the Super Volcanic Pore Clay Mask and stand a chance to join the Global Beauty Tour with Lee Min Ho in Seoul!